Carbon emissions to the atmosphere from streams and rivers are expected to increase as warmer water temperatures stimulate faster rates of organic matter breakdown. But a new study led by University of Utah researcher Jennifer J. Follstad Shah, in collaboration with a team of 15 scientists in the U.S. and Europe, suggests these decay rates may not increase as much as expected. In fact, the study indicates average breakdown rates may increase 5 percent to 21 percent with a 1 degree to 4-degree Celsius rise in water temperature—half as much as the 10 percent to 45 percent increase predicted by metabolic theory. Mean annual water temperature for some streams and rivers is currently rising at an annual rate of about 0.01 degrees to 0.1 degrees Celsius due to changes in climate and land use. The study "Global synthesis of the temperature sensitivity of leaf litter breakdown in streams and rivers" was published Feb. 28 in Global Change Biology. Streams and rivers cover about 3 percent of the Earth's land surface but are an important contributor to the global carbon cycle. These waterways constitute a major habitat where organic matter such as leaf litter is transformed through physical processes and consumption by microbes and invertebrates. Some of the organic matter consumed contributes to the growth of these organisms, but a portion is 'lost' downstream as invertebrates tear litter into smaller pieces and some is emitted to the atmosphere as carbon dioxide through respiration. Carbon dioxide is a greenhouse gas that contributes to global warming and ocean acidification. 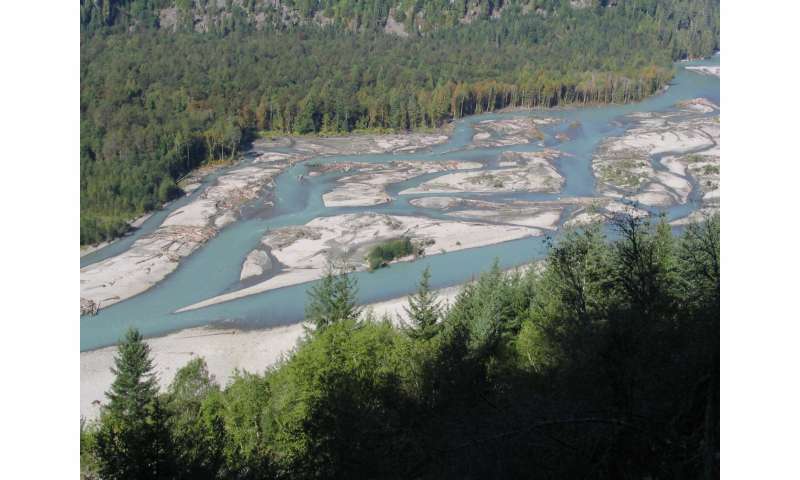 Warmer water enhances the breakdown of organic matter, but it is unclear if climate change will result in more carbon emitted to the atmosphere relative to carbon transported downstream to the ocean. "This process is not as obvious as the melting of ice caps and impacts on a charismatic creature like the polar bear, but it is an important indicator of global climate change," Follstad Shah said, and one that has implications for values used in climate change models. "There is still a lot about the carbon cycle we don't understand," she said. "Understanding the temperature sensitivity of ecosystem processes that govern carbon cycling is imperative as global temperatures rise." The new study reviewed data from more than 1,000 reports representing 41 countries and 85 different plant genera to quantify the sensitivity of litter breakdown in streams and rivers to changes in temperature. It took into account invertebrate density, global position and litter quality as factors controlling temperature sensitivity of litter breakdown. The study found that rising temperatures will likely increase the rate of litter decay but not quite as fast as expected based on metabolic theory, Follstad Shah said. Metabolic theory posits that organisms' metabolic rate, which depends in part on temperature, governs ecological processes. 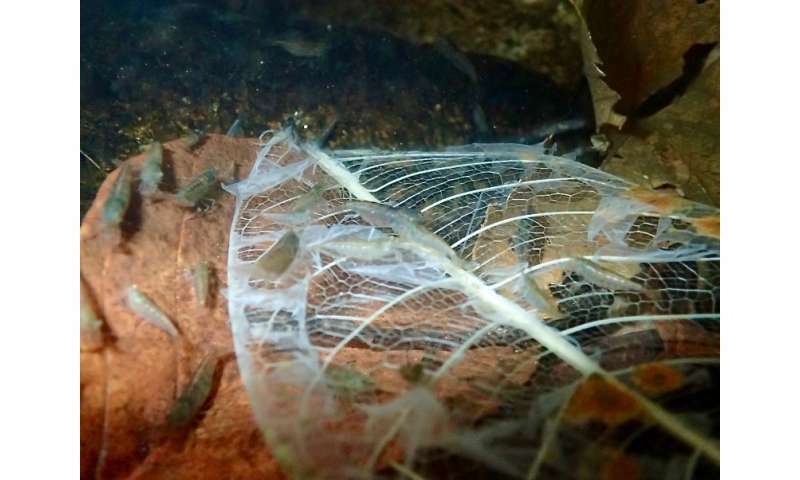 In this case, according to metabolic theory, the rate of litter breakdown would depend on the metabolic rate of stream organisms—which is stimulated by elevated temperatures. Follstad Shah and colleagues found that temperature sensitivity of litter breakdown was greater in tropical than temperate biomes. The study estimates that a roughly 10 percent increase in litter breakdown rate requires only a 1-degree Celsius rise in the tropics but a 4-degree Celsius rise in temperate biomes. Temperature sensitivity varied among the different plant types, which the data suggest may be due to differences in leaf chemistry. The study also found temperature sensitivity of leaf litter breakdown was similar whether mediated by microbes alone or by microbes and invertebrates. That suggests the balance between the amount of carbon dioxide released versus the amount of carbon remaining in solid form—leaf litter moving downstream as smaller particles to an ocean—should remain relatively consistent even if temperatures rise, Follstad Shah said. It also suggests that it is possible to make an initial, broad-scale forecast of breakdown rate response to altered stream temperatures. "Our study is applicable to efforts using standardized measures to gauge the health of streams and rivers," she said. Many streams and rivers around the world are impaired. Sometimes impairment is due to shifts in water temperature or other forms of pollution. "Litter breakdown is an integrative process. It can be thought of as a digestive system," Follstad Shah said. "We can determine if a stream or river is in good condition if we know how litter breakdown is expected to change under different settings, similar to how physicians diagnose human health." leaf litter out gas continued during the last glaciation and during the Roman and Medieval Climate Optimums as well . . . since it is warmer NOW than the last glaciation and cooler NOW than during either the Roman OR Medieval Climate Optimums tell me again why it matters when leaf litter will be releasing increased amounts of CO2? tell me again why it matters when leaf litter will be releasing increased amounts of CO2? .........because when you die & are reincarnated you may come back as a leaf. Don't you think it would be nice to know your fate by the time you come to the end of your future life? I sure would want to know this at a time while I still have the present sense of consciousness that I won't have as a leaf. It matters to the short term warming effect and, if you just bothered to read this link you would know climate change may change the amount of carbon emitted from leaf litter to the atmosphere relative to carbon transported downstream to the ocean. Admittedly, I somehow don't think that would make any significant difference at least not compared to other factors. Admittedly, I somehow don't think that would make any significant difference at least not compared to other factors.